Ploughing is a skill that allows a Bull to be harnessed to a Mouldboard Plough to create a Vegetable Field. Fields grow vegetables similar to how greenhouses grow grass. The skill is also required to plant vegetable seeds in the field, though it is not required to harvest grown vegetables from a field. With the ploughing skill, you will receive a new option, to make a Mouldboard Plough, on a Carpentry Shop equipped with a Vise Bench. The Mouldboard Plough can be equipped on a Bull that is located inside a Ranch. With a Mouldboard Plough in inventory, a bull in a ranch will have the option "Attach Plough". Selecting this will produce the message With a lasso you can plough fields across the land. 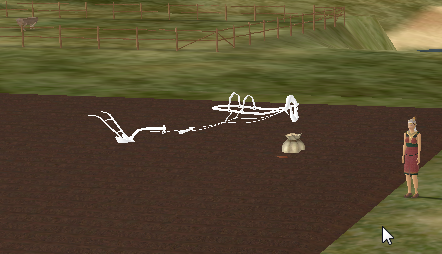 With a Lasso in inventory, you will get an option "Instruct... Start", this will produce the message Walk to the task location, and start a suitable Farming project. You will get a new menu option, Self > Projects > Farming > Plough Field. Select this as the desired location of your field. Where you are standing, when you start ploughing determines suitable veggies. Even if your plough site touches grass, dirt and sand; the terrain where you are standing determines what can be planted. i.e. If you were standing on dirt (and dirt icon appears) when you begin ploughing, then you can plant peppers. Likewise, if the sand icon is appearing, when you begin ploughing, then you can plant onions, etc. The ploughed area will let you plant any type of seed, regardless. But when it's time to harvest, you will get a land is not suitable message and zero yield. Remember the center of the plot is always where you were standing when you started ploughing. The field size and orientation are preset. It isn't possible to rotate them. Where you are standing when you Start a field is the center point of the field. If the bull dies in the process, the floor will have bones, leather and the plough. 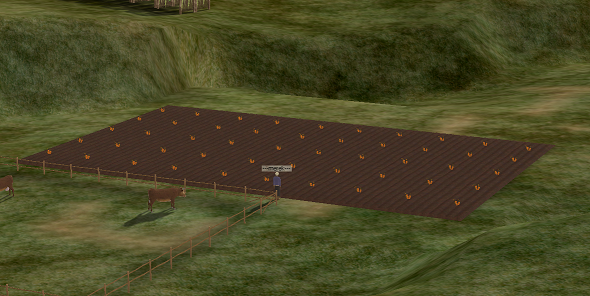 Attempting to plant seeds during ploughing will produce a popup (The Vegetable Field is busy. Please wait). Growing takes 20 minutes, after which you can harvest. A field yield from the wrong type will tell you after clicking Harvest "Your field didn't produce anything useful. Maybe the land is not suitable?" A field can be replanted immediately after harvesting. After a certain number of harvests (10? ), a field will be rendered unsuitable for farming. When the field is exhausted, it will disappear and you will receive a message stating that "This field can no longer support another crop cycle." Veggies harvested from a field do not apply toward offlining. Grain cannot be planted (these are veggie fields). Water tables are unaffected by farming in vegetable fields. Bulls risk sudden death while ploughing fields. Bulls that expire in this way will return bones and leather. Per Malard, a Bull can work fields at least 10 times before risking death. It is unknown if a Bull can recover back to a fully healthy state, if left unworked for a time. "We're calling it 'ploughing' instead of 'plowing' because I guess we're an English game now"
"My idea for how ploughing should work is that you plant a field, and you have to 'turn it over' every 24 hours, sort of like greenhouse, but for veggies"
"The problem is, there is no room for ploughing with pyramids, crossbreeding, region/faction bonuses, and aqueducts." "Ploughing will be a skill, not a tech"
This page was last edited on 16 February 2019, at 04:04.